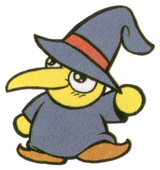 Keipu is an enemy that appears only in Super Mario Land 2: 6 Golden Coins. This enemy appears only in the 4th stage of the Macro Zone, where there are only two of them. It snatches 1 UP Hearts from ? Blocks and runs away from them, attempting to keep Mario from retrieving them. If Mario manages to catch up to and defeat the witch, it will reward him with the missing heart. Keipu Possibly corrupted from the word "keep," referring to their thieving behavior. This page was last edited on October 30, 2018, at 22:10.